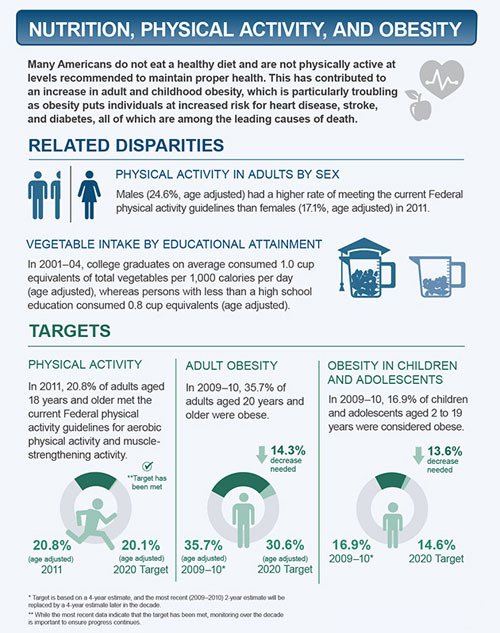 Many Americans do not eat a healthy diet and are not physically active at levels recommended to maintain proper health. This has contributed to an increase in adult and childhood obesity, which is particularly troubling as obesity puts individuals at increased risk for heart disease, stroke, and diabetes, all of which are among the leading causes of death. Males (24.6%, age adjusted) had a higher rate of meeting the current Federal physical activity guidelines than females (17.1%, age adjusted) in 2011. In 2001–04, college graduates on average consumed 1.0 cup equivalents of total vegetables per 1,000 calories per day (age adjusted), whereas persons with less than a high school education consumed 0.8 cup equivalents (age adjusted). In 2011, 20.8% of adults aged 18 years and older met the current Federal physical activity guidelines for aerobic physical activity and muscle-strengthening activity. In 2009–10, 35.7% of adults aged 10 years and older were obese. In 2009–10, 16.9% of children and adolescents aged 2 to 19 years were considered obese. *Target is based on a 4-year estimate, and the most recent (2009–2010) 2-year estimate will be replaced by a 4-year estimate later in the decade.